In a large saucepan away from heat, combine the sugar, cornstarch and salt. Add the egg yolks and stir to make a thick, yellow post, then gradually whisk in the half and half. Put the saucepan over medium heat and whisk constantly until mixture begins to boil and thicken. When mixture thickens and boils, continue whisking for 1 minute. Remove from heat and whisk in the butter. Let cool slightly, then stir in the vanilla extract, coconut extract and 2/3 cup coconut. Let filling cool, then transfer it to the tart shell, spreading to the edges. Cover with a piece of plastic wrap and refrigerate until cold. 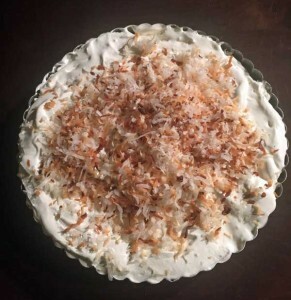 Spread whipped cream over the top and sprinkle with reserved coconut. To toast the reserved coconut, bake it on a foil lined tray at 350 just until edges start to brown, then mix it all up on the pan. Let cool. In an oven proof bowl (Pyrex or Pampered Chef Batter Bowl), combine the butter, oil, water, sugar and salt. Put the bowl in the hot oven for 15 minutes or until butter starts to brown. Carefully remove from oven and stir in the 150 grams (heaping cup) of flour. It should clump up into a ball. Let it cool to touch, then press it over and up the sides of a 9 inch removable bottom tart pan. Set the pan on a baking sheet and bake for about 15 minutes or until edges are nicely browned.